Notes: The remains are found in Castle Bytham (which grew up from serving the fortification). No dedicated car park but on-road parking is possible directly opposite the earthworks and a circular footpath provides a short but pleasant walk around the site. A large motte and other earthworks associated with a substantial medieval fortification along with elements of the water management system. Regrettably the remains are on private land with no access. Some of the rare and impressive features of the site - notably the inner barbican - are not visible from the adjacent public right of way. Bytham Castle Layout. The castle consisted of a substantial motte topped by a shell keep with internal courtyard. A second mound supported a tower with an inner barbican running between it and the motte. The inner bailey was protected by numerous towers which were unusually set back from the rampart. A series of water features surrounded the castle. 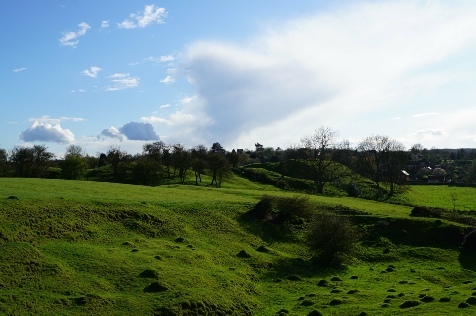 Built upon a natural spur projecting into the valley of the River Tham, Bytham Castle was a significant motte-and-bailey fortification. It was surrounded by a sophisticated water management system creating a series of water features for economic and defensive reasons. It was besieged by Henry III in 1224 and later was home to John of Gaunt. The origins of Bytham Castle are uncertain but it is possible the site was founded by Odo, Bishop of Bayeux (and half-brother to William I) in the late eleventh century. However, the first recorded reference is not until 1141 when it was owned by William le Gros, Earl of Albemarle. Through the marriage of his daughter - Hawise, Countess of Aumale - it passed to William de Fortibus, Earl of Albemarle. His son, also called William, held it during the First Barons War and although he had been a signatory to Magna Carta ultimately supported King John during the conflict. Following that King's death in October 1216, he supported Henry III including fighting at the Second Battle of Lincoln (1217). William soon fell out with the new regime however - which was dominated by Hubert de Burgh - and in 1220 he refused to obey orders to surrender Rockingham and Sauvey Castles. Both were forcibly retaken by the Crown and in 1221 William rose up in revolt. Henry III mobilised Royal forces against him, besieging and capturing Bytham Castle. Although William was eventually reconciled with Henry, Bytham Castle was granted to William de Colvile. 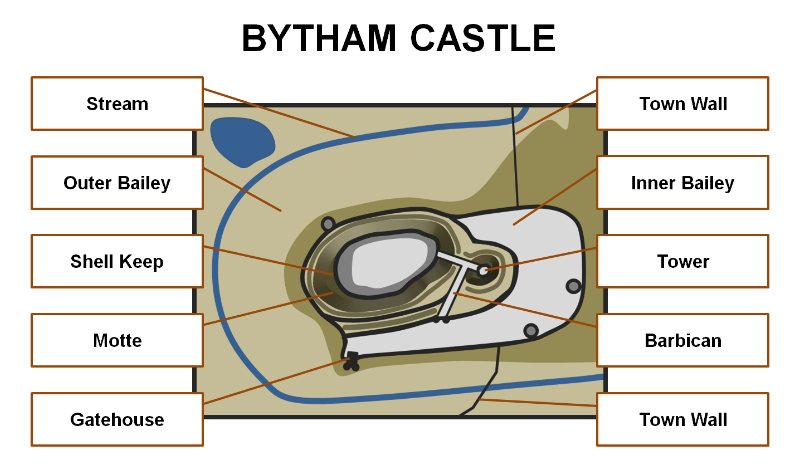 Throughout the eleventh and twelfth centuries, Bytham Castle would have been an earth and timber fortification. It is possible that William de Fortibus had commenced rebuilding some of the structure in stone but, if so, it was nevertheless substantially rebuilt by its new owner. Once completed it was a significant structure with a huge shell keep dominating the summit of the motte. Internally this had several rectangular buildings arranged around a central courtyard possibly with a tower or Keep in the southern section. A small mound of similar height to the east of the main motte, which was connected by a narrow causeway and occupied by a hexagonal tower, has been interpreted as an internal barbican. An 'L' shaped inner bailey, divided into two courtyards, was located to the south/east of the motte and contained all the ancillary buildings associated with such a settlement including brewhouse, bakehouse, kitchen and stables. An outer bailey was established between the stream and the motte although this seems to have lacked any defences suggesting it was simply used as pasture. The entire site was surrounded by extensive water features controlled by dams and sluices for both defensive and economic needs including fishing, powering mills and provision of fresh water. A settlement also grew up in vicinity of the castle in the location of the current Castle Bytham village and this was protected by a substantial stone wall. The castle was clearly highly regarded for in the late fourteenth century John of Gaunt, Duke of Lancaster chose to raise his children at Bytham including Henry Bolingbroke (later Henry IV). He later did the same with several of his younger children including John, Duke of Bedford and Humphrey, Duke of Gloucester. Nevertheless the castle declined in the sixteenth century and was reported as ruinous by 1544. It was subsequently plundered for its stone leaving just the earthworks and foundations seen today. Regrettably there is no public access onto the castle mound itself.